This is the latest wacky and wonderful experiment from Dr Bill Lumsden, head of whisky distilling and creation at Ardbeg. Trying to understand the complex interactions taking place in the cask during maturation is like trying to understand Stephen Hawking’s A Brief History of Time whilst on LSD. It’s nigh on impossible. I’ve tried*. 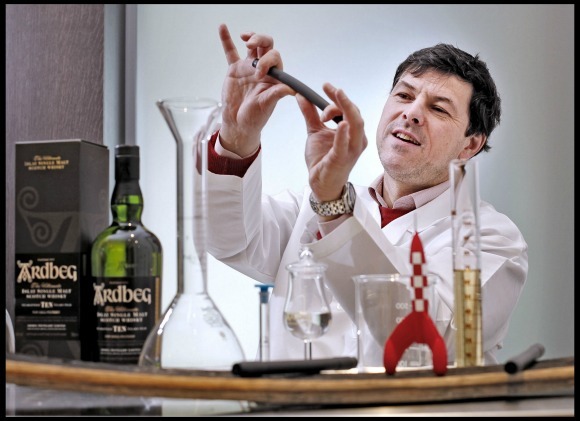 So to try to better understand what happens during this magical process, Ardbeg have teamed up with US-based space research company NanoRacks and launched some new make spirit and some barrel shards in the direction of the International Space Station (ISS). The vials, called “mix-sticks”, containing these particles look much like a glow stick. Except it’s rubbery. And it doesn’t glow (see the photo of Bill flexing his guns and breaking a mix-stick above). Anyway, one half contains distillate primarily consisting of terpenes and the other half contains the wood particles. Terpenes, by the way, are the molecules which are very aromatically active and in the case of lanilool, for example, give a citrusy note to a whisky’s bouquet. Upon arriving at the ISS these mix-sticks were snapped and the contents allowed to… well… err… mix. As with all scientific undertakings there needs to be a control, so in Warehouse 3 at the Ardbeg distillery some mix-sticks have also been snapped to allow a fair comparison of the effect of zero-gravity on this pseudo-maturation process. Still with me? Good. The liquid will be analysed in a couple of years time to determine exactly what’s been going on. According to Michael Johnson, Chief Technical Officer at NanoRacks, this “should help Ardbeg find new chemical building blocks in their own flavour spectrum.” Whatever that means. Regardless, this is a pretty cool experiment and we got the full lo-down from the Doc himself when he gave a lecture at the Edinburgh Science Festival on Tuesday entitled, “Whisky Wisdom – Scotch Whisky; Science, Art or Myth?”. Here, he gave a very in-depth lecture with a molecular twist on whisky production and also took us through a tasting which included Glenmorangie new make, Original, Quinta Ruban and Signet as well as Ardbeg 10yo and an Ardbeg cask sample distilled in 2002 and matured in first fill oloroso sherry casks. I do have tasting notes from this final whisky but I’ll give you Dr. Lumsden’s refined, eloquent thoughts instead: “It sticks to yer lungs!”. Whisky, science and the dulcet tones of Bill Lumsden. Perfection. *No mum, I’ve not. Honest. This entry was posted	on Wednesday, April 11th, 2012 at 4:54 pm	and is filed under Featured, News. You can follow any responses to this entry through the RSS 2.0 feed. Responses are currently closed, but you can trackback from your own site.